Built as a single application using Microsoft's Visual C# 2010. The application is timer driven, with a TAB for each USB connected Radio Stack module. The TAB header shows an indication of the status of the module ie. either connected or not connected. Debug capability is available for each device, this was used during development and can be disabled if desired. 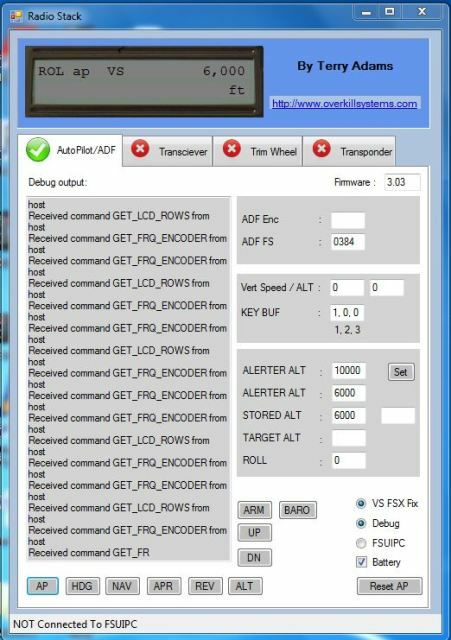 THE ADF/AutoPilot module is shown, with a virtual representation of what is displayed on its LCD.